In this rural house, built in 1700, which is completely integrated in the greenery with olive and citrus trees, there are 4 apartments. The rural house is located a few hundred meters from the central square in Sorrento and near the Amalfi coast. 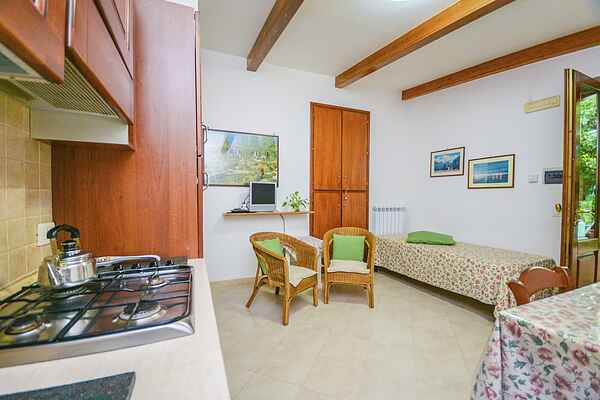 Apartment Edera is a well furnished apartment with air conditioning and has a beautiful garden. The mild and dry climate makes the peninsula of Sorrento an ideal destination in all seasons. It is a unique spot in the world, where you can choose between quiet and nature, culture and nightlife. The rural house can be reached on foot or by a small car via an old, sloping Roman road. For larger cars there is a secure and covered parking available 600 meters away from the house (for a fee). The center, Piazza Tasso, is about 1 km away. The house is not suitable for people who have difficulties walking because of its location.